With over 1 billion users creating content, sharing news and posting photos, it was only a matter of time before Facebook started limiting which content appears in newsfeeds. 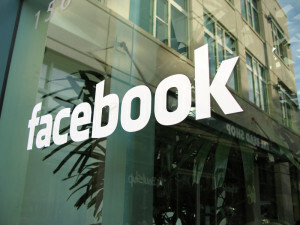 With Facebook’s new guidelines and rules, every business page’s organic reach took a hit. 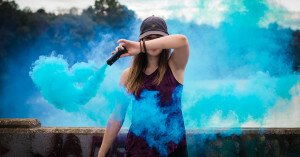 Organic reach is defined as the number of unique people who saw your post in their newsfeed, either because they are a fan of your page or a friend shared, liked or commented on your post. Two years ago, organic reach for most Facebook pages was around 17 percent, meaning your posts would reach an average of 17% of your fans, without any promotion. Now it hovers around 6.5 percent, according to a recent study from Edge Rank Checker. So how can brands fight back and increase their organic reach naturally? Facebook uses a few things to calculate how important your post is and whether or not it deserves a higher spot in someone’s newsfeed – the number of shares, likes and comments. Here are some ways you can increase your social reach. 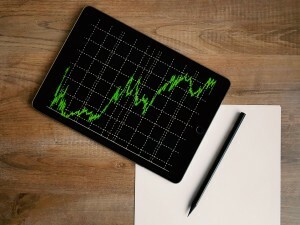 Shares are becoming increasingly important for your reach. Every time your fan shares a post or image, it appears on their newsfeed which is more likely to rank higher in other’s newsfeeds than your own post. What is deemed as share-worthy depends on your target audience and what has worked well with your fans in the past. For fashion retailers, this could mean sharing DIYs or style guides. For sport retailers, this could mean sharing game day recipes or humorous posts. The bottom line – post content that is helpful and worthwhile for your fans to read. Facebook has taken a stand on visuals. Posts can now only contain 20% text, leaving 80% of your post for visuals. Increase likes by including stunning images that tell a story. Your fans will be more willing to ‘like’ a post if the image is something they can relate to. Always make sure that your image evokes some sort of emotion like laughter, love, or nostalgia. Feature fan generated photos to increase brand advocacy and generate more shares as others try to become featured fans. 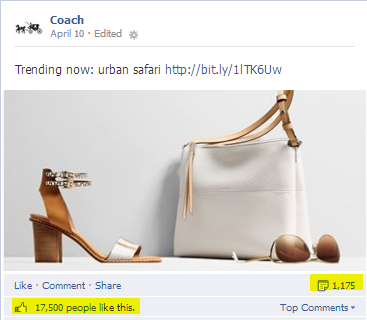 For example, Coach has a very large style savvy fan base. Their Facebook posts consists of what is trending now which works well with a fashion forward demographic. Questions are also a great way to get feedback, either likes or comments. Ask fans to vote between two products to increase discussion and comments. 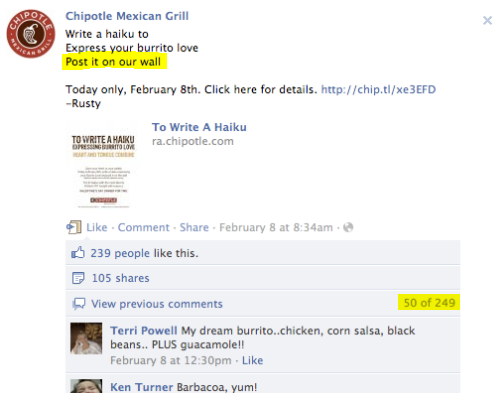 Chipotle ran a Post Contest earlier this year and got a huge response from their fans. Encourage your employees to like, share and post on your page to increase overall engagement. Your biggest fans should be your employees. They are the ones that know your product inside and out and can be your biggest advocates. Take your social reach to the next level by adding one of these Annex Cloud boosts. These few social tools can quickly increase your social engagement and fanbase. Contests are fun and work when your fans are properly incentivized. Try a Like-Gating contest on your site to increase your fan’s engagement on social and grow your fan base. 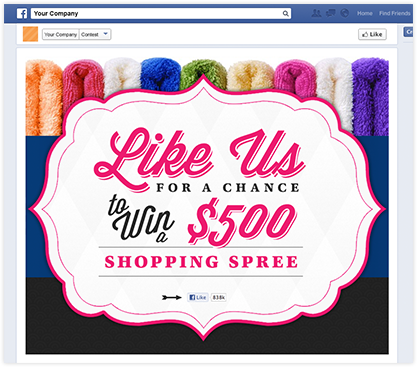 To increase engagement on your Facebook page try hosting a Post Contest. Turn any post into a contest by asking your fans to submit captions and vote for their favorites with likes, similar to Chipotle’s Haiku contest. With Annex Cloud’s Post Contests, you’ll gather insights and social data from every comment as well. Make sure that Facebook actions are part of your loyalty or rewards programs. Reward your shoppers for their social advocacy to keep them happy, engaged and primed to become loyal brand advocates.